The lineup has been revealed for this year’s Louder Than Life festival. 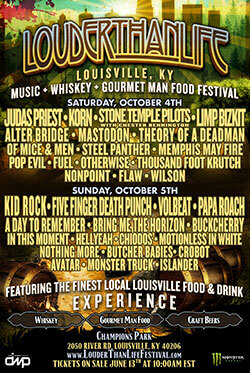 The festival will take place October 1-2, in Louisville, KY and will include: Avenged Sevenfold, Slayer, The Cult, The Pretty Reckless, Pierce The Veil, Cheap Trick, Chevy Metal, Anthrax, Motionless In White, HELLYEAH, Sick Puppies, The Amity Affliction, Avatar, Neck Deep, Young Guns, Being As An Ocean, ’68, Twelve Foot Ninja, Dinosaur Pile Up, Slipknot, Disturbed, Korn, Ghost, Alter Bridge, Clutch, Biffy Clyro, Pop Evil, Skillet, Sevendust, Zakk Sabbath, Parkway Drive, Trivium, Kyng, Skindred, Adelitas Way, Crobot, Smashing Satellites, and Sabaton. 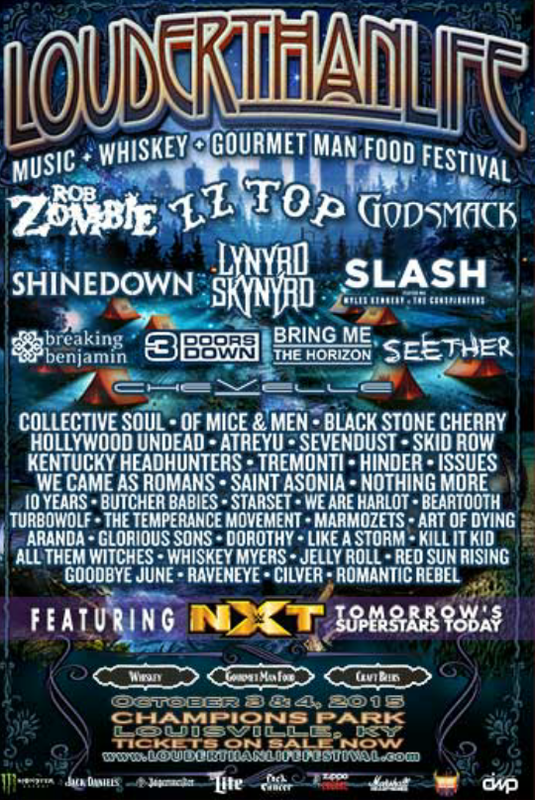 Rob Zombie, ZZ Top, Godsmack, Shinedown, Lynyrd Skynyrd, Slash featuring Myles Kennedy & The Conspirators, Breaking Benjamin, 3 Doors Down, Bring Me The Horizon, Seether, Chevelle, Collective Soul, Of Mice & Men, Black Stone Cherry, Hollywood Undead, Atreyu, Sevendust, Skid Row, Kentucky Headhunters, Tremonti, Hinder, Issues, We Came As Romans, Saint Asonia, Nothing More, 10 Years, Butcher Babies, Starset, We Are Harlot, Beartooth, Turbowolf, The Temperance Movement, Marmozets, Art of Dying, Aranda, Glorious Sons, Dorothy, Like A Storm, Kill It Kid, All Them Witches, Whiskey Myers, Jelly Roll, Red Sun Rising, Goodbye June, Raveneye, Cilver and Romantic Rebel.